ENERGY STAR®, the U.S. Environmental Protection Agency (EPA) label you commonly see on energy efficient items in stores, promotes the construction of homes that use energy wisely by their construction and high quality HVAC systems and appliances. 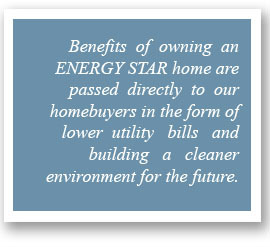 We are proud to offer new homes that have earned the ENERGY STAR label. ENERGY STAR qualified new homes are substantially more energy efficient than homes built to the minimum code requirements. 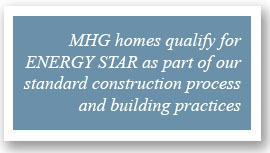 MHG homes that qualify for the ENERGY STAR label are at least 15% more energy efficient than homes built to the 2004 International Residential Code, and include additional energy-saving features that typically make them 20-30% more efficient than standard homes. Effective Insulation — Properly installed insulation that meets or exceeds national code requirements helps achieve even temperatures throughout the house while using less energy. The result is lower utility costs and a more comfortable home. High-Performance Windows — Energy-efficient windows employ advanced technologies, such as protective coatings and improved frames, to help keep heat in during winter and out during summer. These windows also block damaging ultraviolet sunlight that can discolor carpets and furnishings. Tight Construction and Ducts — Attention to detail by sealing all holes, cracks, and seams in ducts and construction assemblies helps eliminate drafts, moisture, dust, pests, and pollen. This improves comfort and the quality of indoor air, while lowering maintenance costs. Efficient Heating and Cooling Equipment — More efficient and properly sized heating and cooling systems use less energy, which reduces utility bills. These systems also turn on and off less frequently, removing more humidity and providing better comfort. Efficient Products — ENERGY STAR qualified homes may also be equipped with ENERGY STAR qualified products — lighting fixtures, compact fluorescent bulbs, ventilation fans, and appliances, such as refrigerators, dishwashers, and washing machines. Third-Party Verification — With the help of independent Home Energy Raters, ENERGY STAR builder partners choose the most appropriate energy-saving features for their homes. Additionally, raters conduct onsite testing and inspections to verify the energy efficiency measures, as well as insulation, air tightness, and duct sealing details. Compared with standard homes, ENERGY STAR qualified new homes use substantially less energy for heating, cooling, and hot water heating. Homeowners can expect to save about $200–$400 annually on their utility bills. Over the average 7 to 8 years you may live in your home, this adds up to thousands of dollars saved on utility bills. 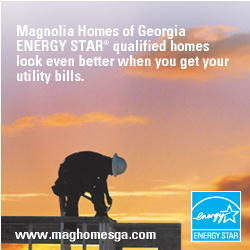 Look for the government-backed ENERGY STAR label to easily identify homes that are truly energy efficient. Find the house of your dreams and enjoy peace of mind knowing that it also meets strict energy efficiency guidelines.